Boulby Mine’s endless tunnels and roadways stretch far out deep below the North Sea, and their direction is guided very precisely by a team of Geologists led by Chief Geologist Peter Edey. The geology department consists of two branches, the first being exploration geology led by Thomas Edwards. This team study the rock patterns, formations and more to determine where key minerals lie beneath the surface. They then pass this data on to the second branch, the production geologists, led by Steve Thornton. It is this knowledge which drives the drilling into new areas, taking Europe’s second deepest mine even further underground and into new frontiers of mining. Exploration geologists are responsible for the mapping of the minerals (both good and bad) we have underground at Boulby Mine. They look for not only where the minerals occur, but how thick and how easy they are to access with our industrial machinery. This enables the production geologists to accurately design a strategy for the extraction of the mineral. Exploration geologists provide the information; production geologists create plans to move forward and guide the mining of the mineral underground. The foundation for Boulby’s existence is to extract mineral fertilizers from the ground, which can then be used around the world to help feed the planet’s growing population. Hence, ICL’s Where needs take us philosophy. Essential to meet humanity’s growing need for sufficient food worldwide, these fertilizer minerals are invaluable and so our dedicated team of geologists work tirelessly. Exploration geologists are able to explore for new mineral resources by working alongside the exploration drilling team. Drilling extracts long pieces of rock which helps build up a picture of the surrounding geology. Geologists study the drill core and take samples of mineral enriched areas to determine how much ore is present, how thick it is and how far it extends laterally. They also identify any obstacles the production geologists may face when mining those areas, such as unusually hard or soft minerals which can cause problems for machinery or roadway stability. The rocks samples we bring to the surface from exploration drilling have not seen the light of day for 260 million years. The potash and polyhalite were deposited in the Permian period of geological history – before the time of the dinosaurs. It is truly an astonishing process which is in essence travelling backwards through geological time. Various computer software helps the exploration geologists build geological maps and models of the mineral deposit we have underground. 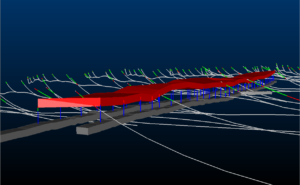 The data they retrieve from extensive drilling is input into this software and stored as a ‘data cube’ that gradually becomes whole enough to be passed onto the production geology team. Simply put, the exploration geologists use long hole drilling samples to understand and model the size and shape of mineral resources. This information is passed onto the production geologists who use this knowledge to guide the roadways towards the best mining areas. These roadways are advanced until the mineral reserve of good quality and sufficient thickness is exhausted. If the geology of the area being mined differs from what is expected then the model is revised and the production geologists devise a new plan for mining. Here at ICL UK, we follow strict certification and criteria that our products should meet before we sell it. Collecting and analysing samples from our mining areas underground is of utmost importance as it allows us to continuously monitor the quality of the mineral we mine. We call this process grade control and it allows us to rectify our approach should it fall below our standards. Our exploration geologists have identified and are continuing to discover an abundance of polyhalite reserves, our new multi-nutrient mineral that we have now turned our attention towards. Our polyhalite is safe to mine and is present in sufficient quantities to invest in the development of its efficient extraction. So far, we have an estimated 1 billion tonnes of polyhalite resources, some of which we are currently mining, making ICL UK the sole producer of polyhalite worldwide. In 2017, we reached a landmark of 1 million tonnes of polyhalite mined at ICL Boulby and we’ve got big plans to come. We’re the only ones mining it globally and with our expertise, we plan to mine 1 million tonnes per year by 2020.